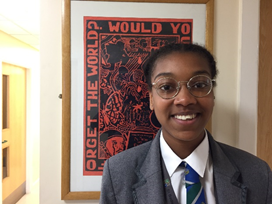 The talented Naomie Soda (year 9) took part in Million Women Rise march in London. The march ended in Trafalgar Square, Naomie stood up at the podium facing the lions and delivered a blistering poem of her own that she had learnt off by heart for the occasion. She was spectacular - what a talent and what courage.